Have a knack for knowing and reciting the most obscure facts on music, film, literature, sports or celebrity?! 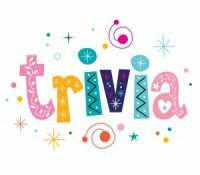 If you answered “Yes!”, join The Parkinson Council’s 1st Annual Trivia Night on Saturday, April 27th, 6:30 pm to 9:30 p.m. Exercise your brain, laugh, celebrate, and make your teammates proud as you raise funds to support our mission to “touch a life” every day! Best Bet? Grab a Sponsorship! Click here for more info or call us at 610.668.4292.